There was a mass house in Ballyanrahan West near Patrickswell village. In 1840, it was a thatched building. While nothing of the house remains today, the site is known. In 1847 a new church was built in Lurriga and this was used as the parish church until the building of the present day church. The land was bought from Captain George Tuite. 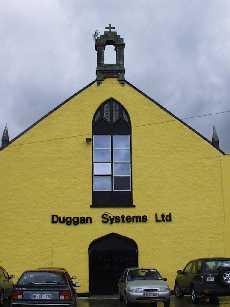 The church building is still standing and is now used as business premises. Mainchín Seoighe's "County Limerick - Its People and Places" says that the church in Kilkeedy was built in honour of the saint, St Caoide, whose feastday was on October 25th. However, Westropp mentions in his "Survey of the Ancient Churches in the County of Limerick" that the church was dedicated to St Simon & St Jude, whose feast day falls on October 28th. This church was dated from the early 13th century and nothing remains of it today. A second church was built in the 17th century in Kilkeedy and there was a thatched roof on the church in 1615. The site of this church was where the new wall around the graveyard was recently built. Nowadays, the only ruins here are of a Protestant church that was built in the 19th century. Westropp visited the church in 1905 but all that remained was the north wing, which were 29 feet north, and south and 18 feet wide. There is also a church ruin in Cloonanna. This church dates from the 13th century. Mass was said at Cloonanna in 1998 for the first time in around 400 years according to Monsignor Lane. The church in Esclon was on the site of Carrigogunnell and was merged into the parish of Kilkeedy in 1419. Westropp stated that the church in Newton could be also be the church in Esclon. The church was dedicated to St Margaret and is referred to as St Margaret's church in some books. The feastday of St Margaret's church was July 20th. 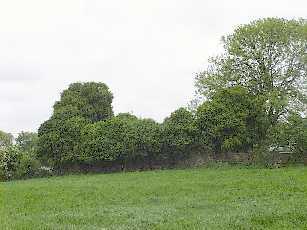 The ruins were situated near the Shannon River. There are ruins in the place known as Churchfield estate. The ruins, known locally as St Margaret's church, are now covered by ivy. Churchfield estate is located in Newtown, and Mike McNamara informed us that this is the same St. Margaret's church to which Westropp referred. There was a church called Killeen in an area known as Church Park. The church was Celtic church. While the site is still pointed out, nothing remains of the church as when the river was widened, the Board of Works removed the remains of the church. We spoke to one local man Bill Davoren who remembered seeing the outline of the church when he was young. Mr Davoren also told us that the mass paths that the people travelled to reach the church are still easily seen. According to Sheehan's 'A Corner of Limerick', Killeen and Church Park are two separate churches. There are also a number of churches of which we could find no ruins. There are no remains of the church in Kiltemplan. 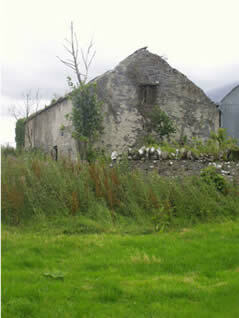 There was also reputedly a church in Kilcolman, which was a parish in penal times. There was a church in Kilboy and a church in Kilnacally, which was believed to be in the townland of Elm Park. The sites of these churches are now forgotten. There was also a church in Killasragh that was named after St Lassara, a 6th century saint whose feastday was on March 29th. On the same site, there was a killeen but the site was levelled over a century ago. According to Sheehan, there was also a church in Kilcornan in the land of a Mr McSweeney. 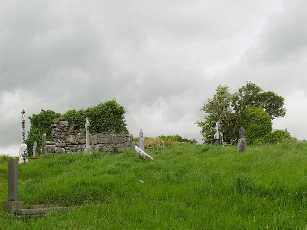 About 500 yards to the left of Kilcornan graveyard, there is a large building that Mr McSweeney thought might have been the church to which we referred. The structure of the building seems to be mainly intact but we were unable to enter the building to determine if it was a church. There was a church near the old filling station in Garranore that was on the lands of Walter Quirke. He took the stones of the church away to built a house to Killaloe. No one knows where exactly the site of this church was. We would like to thank George Quain of Garranore for this information.